The photo above shows a mom and her two offspring. Snowmass Lady Guinevere, the grey alpaca in the distance, was our first alpaca purchase. Gwenny came to us pregnant with Kilyo's Gingerbread, shown in the foreground, left. Gingerbread was born on Christmas Eve, 2003. Can't get a much better Christmas present than that! 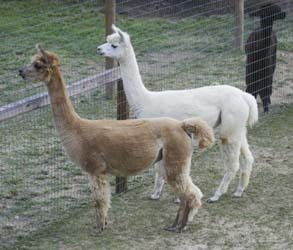 One year later in December of 2004 was born Accolade's Arrow, in foreground right at 3 months of age. 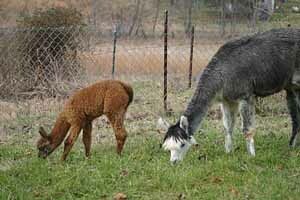 For more pictures of Arrow, see the Herdsires link at left. Gwenny is our grand matron. The experienced girl that every first time breeder should own. She's a wonderful mom: Breeds easily (pregnant on the first 5 minute breeding), births easily (Nancy, who was the only one on site for our first "on our own" birth, was glad we had "the old pro" around to show us how this all works), milk came right in (Arrow came up with his milk mustache right away), everything was as it should be. She's a wonderfully attentive mom. Gwenny with Arrow on day one. Gwenny with Arrow on day 17. Gwenny is fifteen years old now, and with twelve babies under her belt she's been around the block and knows how things are supposed to work. Gwenny leads everyone else around, too. Leader of the pack. They pretty much go where she tells them to. 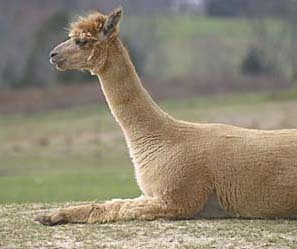 Gwenny is the first alpaca we ever bought. She's not our most friendly girl, preferring to stay away from "two-leggers" as much as she can. Probably because she came out of large-ranch situations without a lot of human contact. (Witness the "hole" in her ear where her numbered eartag was before we bought her. The first second we owned her we said, "OK, let's get that eartag off her right now.") Since she's been with us she's improved, and will now eat directly out-of-hand. She'll only approach humans willingly if there's food involved. Once "caught", she'll stay relatively calm and allow us to do medical stuff to her. 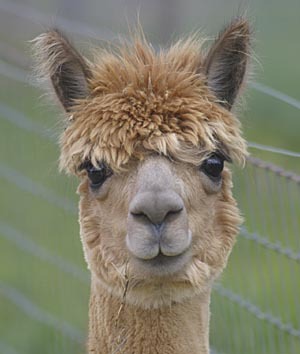 But she remains nervous around humans and would much rather hang out with other alpacas. In the photo above, Guinevere feeds new baby Rumble (who's less than an hour old) as Celeste and Sarah try to make sense of the new alpaca that seems to have appeared on the farm from out of nowhere. 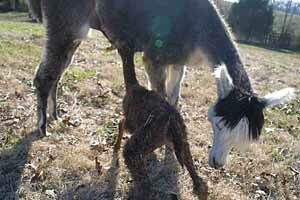 Gwenny has delivered four babies to us thus far. One girl, Gingerbread (Dec., 2003), and three boys, Arrow (Dec., 2004), Quest (June, 2006) and Rumble (June, 2007). As you can see above, she's a great mom. 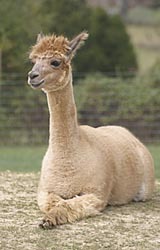 Celeste is the second alpaca we bought to start our herd. She's a big healthy girl with the biggest, most beautiful eyes you've ever seen. 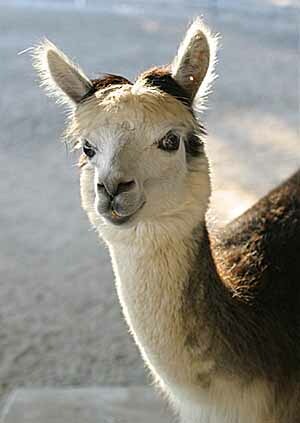 (They're large eyes, even for an alpaca.) And she makes the prettiest babies, who are also big and healthy. 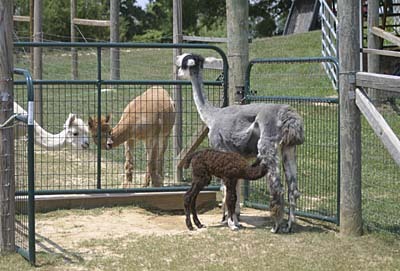 We have two offspring from her, one girl, Sarah (May, 2005), and one boy, Pegasus (October, 2007). 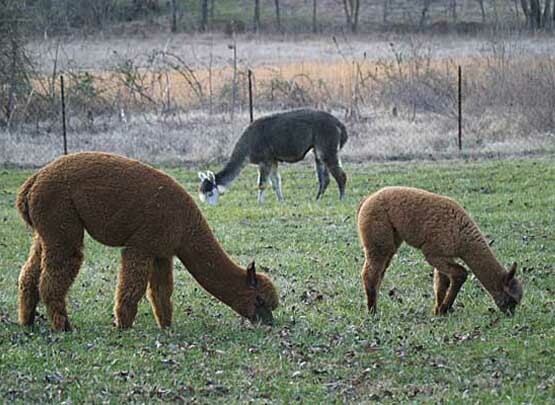 Both are excellent alpacas. 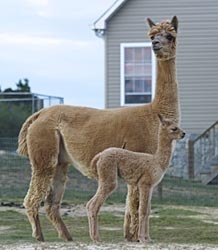 We liked Pegasus so much that we turned right around and bred again to the same herdsire (Pentium, out of Dom Alamir) and are currently expecting a cria in October of 2008. Celeste and Sarah on alert. When Celeste is carrying a baby, she cushes like this a lot in the final months of the pregnancy. We call it her "superman" pose. Still working on write-up for the rest of the herd, but in the meantime, try some of the links further down the list at left, such as Herdsires or Ranch Visits or Tennessee Home. Lots of pictures there. Click here to return to the top of this page: Our Herd.